I just want to wish every reader of Le Physiologiste Merry Christmas and Happy New Year ! I hope all of you will take it easy and have good fun with friends and family ! Yesterday, I received my first Christmas present: I got one of my papers accepted for publication. We regret to inform you that your manuscript entitled “XYZ” was not accepted for publication into HIGH IMPACT FACTOR JOURNAL in its present form. Reviews are attached for your consideration, which I hope will be helpful to you in future studies. The reviewers identify serious concerns regarding your manuscript. If you choose to revise your work and resubmit it, you must effectively respond to these criticisms. Any revised material should be submitted with a letter specifically detailing your responses and any changes in the manuscript. Please understand that we cannot provide you any commitment to publish your work. Experience has shown that only a small number of papers assigned this priority upon initial submission and review are eventually published in HIGH IMPACT FACTOR JOURNAL. Your revised manuscript entitled “XYZ” that you submitted for consideration in HIGH IMPACT FACTOR JOURNAL needs additional revision. We are interested in publishing your manuscript; however, two reviewers continue to have significant concerns with your revised manuscript. Before the paper can be accepted in its final form we would like your comments to the critiques. Accordingly, we invite you to respond to the reviewers’ comments and recommendations. A decision on acceptability of your manuscript will be made only after the revised version has been reevaluated. We are pleased to inform you that your work has now been accepted for publication in HIGH IMPACT FACTOR JOURNAL. All manuscript materials will be forwarded immediately to the production staff for placement in an upcoming issue. Thank you for submitting your interesting and important work to the journal. I am pleased to inform you that your manuscript xxxx-x-xxxx.R1 entitled “A small pilot study with interesting results” has been accepted for publication in the MEDIUM IMPACT JOURNAL. It will appear in the next available issue. Thank you for submitting your excellent article to the MEDIUM IMPACT JOURNAL. “Well, that is nice. Enjoy it for 10 seconds and then, there is another research project to work on“. As soon as I receive a similar email, I think about that sentence. And even today, after over 6 years since that first publication and twenty-seven published manuscripts, I still feel really excited with such good news (but I’ve stopped dancing…). These 10 seconds are just pure happiness. Does that feeling vanish over the years?? I hope not !! Can we improve exercise performance by increasing oxygen delivery to the brain? Since previous studies have suggested that a lowering in oxygen delivery to the brain may eventually limit motor drive especially in hypoxic conditions, it would be cool to manipulate cerebral oxygen delivery to investigate if that variable influence exercise performance. A specific method to alter cerebral oxygenation while holding all other physiological variables constant is needed to definitely test the hypothesis, but may be unrealistic to achieve in human subjects with available technology. These authors theorized that inhaled CO2, that is a potent cerebral vasodilator, may be used to investigate the effects of increased brain oxygen delivery during exhaustive exercise. In this study, amateur cyclists aged between 18 and 45 years performed incremental exercise to exhaustion with and without clamped end-tidal CO2 (PetCO2) to supraphysiologic level (50 mmHg) with normal oxygen level (normoxia; barometric pressure around 630 mmHg) and low oxygen level (hypoxia; barometric pressure around 425 mmHg). The order of the tests (control and clamp) and conditions (normoxia and hypoxia) were randomly assigned and counterbalanced. Clamping PetCO2 at 50 mmHg during incremental exercise in normoxia was associated with higher ventilation, end-tidal O2 (PetO2), cerebral blood flow and brain oxygenation at rest, during submaximal exercise and at exhaustion (without affecting muscle oxygenation). 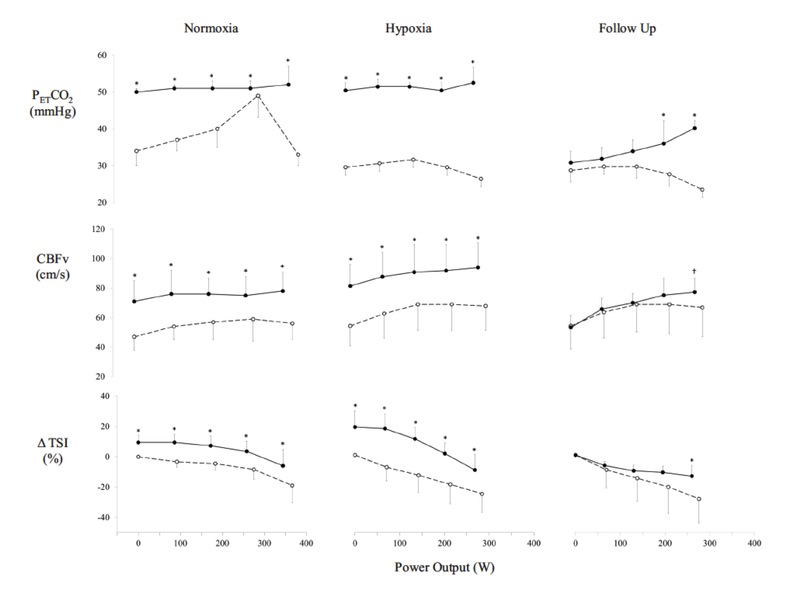 However, maximal power output, peak oxygen consumption and maximal exercise heart rate were all reduced in comparison with the control exercise protocol (exercise in normoxia without clamping PetCO2). Hypercapnia was accompanied by both reduced blood pH and lactate concentrations. Clamping PetCO2 at 50 mmHg during incremental exercise in hypoxia was associated with higher ventilation, PetO2, cerebral blood flow and brain oxygenation at rest, during submaximal exercise and at exhaustion (without affecting muscle oxygenation at rest and at maximal exercise). However, maximal power output and peak oxygen consumption were reduced in comparison with the control exercise protocol (exercise in hypoxia without clamping PetCO2). Hypercapnia was accompanied by both reduced blood pH and lactate concentrations. These results suggest that cerebral blood flow is most likely not the primary factor that limits incremental exercise performance in healthy amateur cyclists (and as suggested by the authors, at least when accompanied by respiratory acidosis). Why exercise performance is reduced with this method? Among the suggested factors that could explain that (surprising) reduced performance notwithstanding increased blood flow to the brain, the authors suggested pH-mediated impairment of performance, the finite structure of the subjects’ respiratory system and the diversion of blood flow away from exercising muscles (because of increased oxygen demand within respiratory muscles and cerebral vasodilatation induced by hypercapnia). Future refinements to the method are needed to control for changes in acid-base balance to determine if small improvements in performance were potentially masked by deleterious effects of reduced pH. It is definitely difficult to control for everything when studying healthy humans !